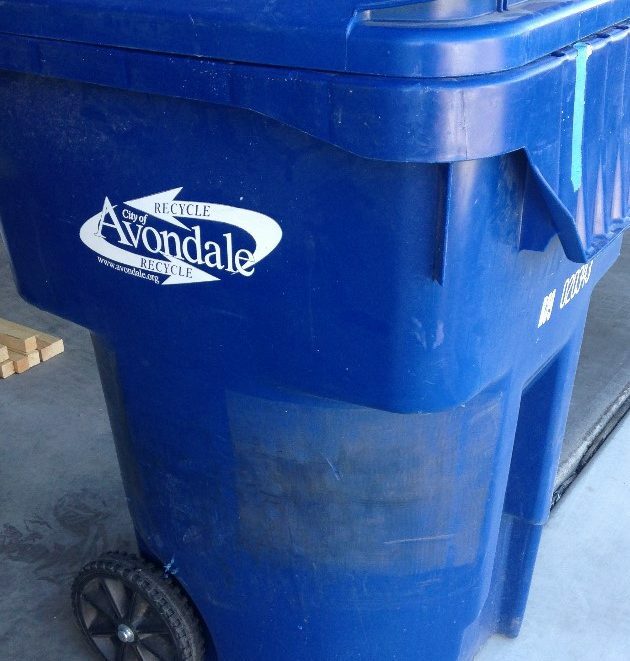 Trash and recycling collection is done by the city of Avondale. See their “Solid Waste Services” page for detailed information. Normal trash pickup (dark green bins) for Rio Crossing is Mondays. See Avondale’s Trash page for details. Normal recycling pickup (medium blue bins) for Rio Crossing is Thursdays. See Avondale’s Recycling page for details. On certain holidays, trash and/or recycling may be delayed to Tuesday and Friday, respectively. See Avondale’s holiday schedule for details. Bulk trash pickup (curbside) is done the week of the second Monday of the month. Most of the time Rio Crossing bulk trash is done late in the week – Thursday or Friday. But not always. Please do not put bulk items out on the street in non-bulk weeks! It makes our community look “always trashy”. Instead, store in your garage or back yard and transfer to the street on Sunday just before the pickup week… or at least stack neatly in your side yard. See Avondale’s Bulk Trash and Green Waste page for details. If you join our mailing list, you’ll get weekly reminders (Friday or Saturday for the following week) along with other community news.